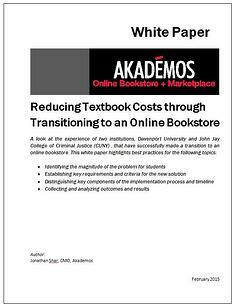 Two years ago, Akademos published the first comprehensive survey of College CFOs regarding the future of college textbooks and bookstore services and again in an exclusive webinar held on April 29th which had released the preliminary findings of the 2015 follow-up study. In both surveys, participants were asked to estimate the breakdown of their bookstore's textbook sales.The latest survey found that on average, new books still represent the largest % of textbook sales; however in just two years this percentage has declined significantly (now 38%, down from 52%) - with Rentals growing by more than 60% (from 14% to 23% in 2015). Yesterday we were joined by Robert Pignatello, SVP Finance and Administration at CUNY’s John Jay College and John Squires, CEO of Akademos for an informative and lively 2015 College CFO Survey on Textbook Affordability and Bookstore Services Webinar. If you were unable to join us for this discussion, please request the presentation and recording of the session today. The feedback from attendees has been extremely positive. Most participants found the survey results and commentary on the trends and future of textbook services extremely relevant and informative. the last few years as students, faculty and administrators are increasingly concerned about the escalating costs of textbooks. Colleges are now searching for new solutions to lower costs and support their core mission of educating students. In the begining of 2013, Akademos published the first comprehensive survey of college CFOs regarding the future of bookstore services. One question participants were asked to address was their opinion on the primary role of the bookstore. Overwhelmingly, College CFO's (80% of them) chose providing textbooks as the bookstore's central objective. Institutions that have taken action are starting to see positive results in saving students money, improving bookstore utilization, and increasing student satisfaction. Over the past three decades college textbook prices have grown 812%, increasing three times faster than the Consumer Price Index. Administrators, faculty, students, and parents are increasingly concerned about the escalating cost of textbooks. Colleges are now searching for new solutions to lower costs and support their core mission of educating students. If you’re not aware of the work of the U.S. PIRG Education Fund & The Student PIRGs (Public Interest Research Groups), you should be. Among other initiatives, they focus efforts on making higher education more affordable. They’ve recently released a new study on the textbook market and the rising impact of cost to students.